ZOL today announced a new fibre internet packaged priced at $39 a month. It’s officially the lowest priced fibre based internet service in Zimbabwe. 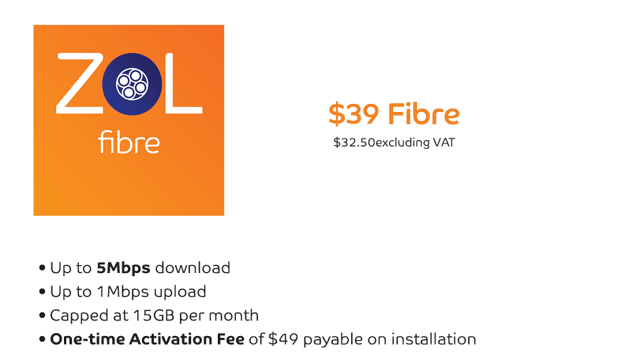 Before now, Zol’s cheapest fibre package was an $89 20GB package which, to many in these hard times Zimbabweans find themselves in, was unaffordably high. The new fibre package is even cheaper than their WiMax package priced at $59. Ofcourse the big condition is that one has to have some fibre installed along their street and so far it’s not clear how much of Zimbabwe that Liquid Project has covered. Last time we checked though, they had done most of the low and medium income suburbs in Harare and were moving into high density suburbs like Warren Park. In terms of the competition in fixed internet, the nearest is TelOne’s $25 10GB internet package, whose speed the company doesn’t disclose anymore. I haven’t used ADSL lately but my experience from months ago wasn’t the best. I would equate it to what I experience on WiMax connections from any provider really (hello ZOL!). Full comparison of local internet prices on this link. The new $39 package is not the only new thing ZOL’s introducing today. They have also increased the data cap on the $89 package to 30GB, effectively creating a big problem for their fixed internet competition priced in that range, like UMax, iWayAfrica, YoAfrica and Africom. Interesting stuff. But at 15GBs that’s like a few downloads. 5 or 6 HD movies only!!! Yes internet was not invented for Internet BUT have you HEARD OF NETFLIX! What was it invented for? I am sure for you it was invented for researching, for a student it was invented for studying while for a gamer it was for gaming. So it all depends what you want to use it for and yes for Castro, it was invented for movies. Just to assist on the Tel-One ADSL speeds you raise. Tel-One recently had a core network upgrade and at completion their basic package has now 1Mbps download. The next package (Silver) is 2Mbps then Gold 3Mbps and Platinum 4Mbps. As a user of the basic package I run very regular speedtests and do get the stated speed consistently. TelOne is the only ISP i have heard of in the world to not advertise there speeds! I agree with PTC’s comment. Not to rush to conclusions but I think the article considers Harare alone and not the quality of service in other parts of Zim. I had the opportunity of working in Redcliffe in Aug and Sept 2014 where the business I was consulting with had the Basic TelOne ADSL package and I was truly blown away by the quality of the service. I know the competition always rubbishes them by throwing the “copper wires” card but they do have a great service. I could video Skype and Facebk call with no lag or calls being dropped and stream YouTube videos. Im not much of a techie so I have never used those speed testing websites you guys use. All I do is go to my fav pirate music site and download my #1 album for 2014, ie, August Alsina-Testimony. The album is 132mb and i have consistently managed to download it in under 15 mins in Redcliffe, Zvishavane, Gweru and Chiredzi. That was definitely more than what I bargained for. Just thought I should share my TelOne experience. I am yet to see ADSL speed in excess of 256kbps in Harare on the basic package. 9:30PM and two speedtests on ookla have just given me download speeds of 0.13mbps and 0.19mbps. Perhaps the upgrade process is still ongoing. Will definitely test the Redcliff speeds next week to see if they are really fast enough to download more than 150mb in less than 15 minutes. Should be getting a bronze package there. Get your connection tested mate. I had slow speed issues on the basic and made some noise at Telone. After some struggle they identified a problem with the line and another on the ComOne end. Sorted out everything and now can get 1Mbps. INTERESTING COMMENTS. Telone ADSL $45 silver package gives you 25GB and I stay in Harare and daily I test my speeds and they are always above 1,4Mb on this silver package. in terms of copper being futuristic, copper still has a future with the new technologies that have been developed like ADSL2+ upgrades and VDSL which can go up to 40Mbps. developed countries are still using copper for their last mile connections and achieving much, so its not accurate to try and rule out Telone service future because of its infrastructure. Yes I agree Fibre has more bandwidth capabilities but some speeds for home use are not justified. Telone is still a game changer….watch out for its soon coming fibre to the homes. Anthony, its up to 5Mbps and not 5Mbps. There is also a vague fair usage policy to deal with. Why is it so difficult for ZOL to disclose min guaranteed speeds or contention ratios. ZOL has taught me to carefully read the fine print. Another thing, Telone $45 gives you 25GB and not 15GB. 1st thngz 1st…its 25GB and another thing z we cannot pretend to be who we r not. We still leave in Zimbabwe is things are not so rosey… Do u think a typical Zimbabwean for example a teacher can afford fiber?? Thats y telone z still the best bet. Just a thot. I think that package is a good deal particularly when you need to entice people to subscribe to the service. Seriously 15 gig come on. If my download speed is supposedly 5mbs as they say, which is never the real life case scenario then that means ill reach my cap in an hour or so. When will isp’s learn that its unlimited we want not a faster to reach your cap. we are still a decade behind south Africa where mweb 4mbs uncapped is priced at R399.Its sad that Zimbabweans actually celebrate this mediocrity we call Zimbabweans isp’s. as far as i was aware, max speed on ADSL was 2Mbps regardless of plan or have they finally started utilising the ADSL2+ technology which can allow for around 14-16Mbps on the last mile? ptc th prob is , u understimated zol plans. besides tht ,we r talkin about fibre here (king of reliability) . yo company must learn from adsl (pricing) providers in south Africa. let me make it clear, why people choose econet 3g over telecel 3 g? its coz econet core system is big enough to meet their demands plus their system is world clss typ. don’t compare fibre with coppr wires, I think basic package inofanira kutambira pa 5mbps, anyway munoita loss here kana tikapedza data redu? handi ndimi munenge magainer coz tinotenga rimwe. kusouth Africa kwacho unomboziva kuti kune maisp mangani here? ko united kingdom ? this is still expensive if you are to compare with Telone. Yes 1mps for the Basic, and when you live out of Harare, it is a blessing and thank you Telone. We never encounter problems only when we have a Power Cut. Econet broadband is terrible and hate using it when I have to. Hangs and everything else when you use your phone and the most expensive I understand in Africa. And the worst connection possible out of Harare. You can say that again here in gwanda telone ADSL is great and the speeds are constant. I have been on Telone ADSL for 3days now and the speed is at 1Mbps, consistently. I’m loving the service, and yes i got an ADLS2+ moden which i guess means the capability to reach 14Mbps exists on their last mile. Keep up the good work Telone. Oh, and i;m in Harare by the way! This is one biased article. As much as Techzim mentioning Telone, ZOL also does not disclose the speed as “up to 5Mbps” is a range and not the connection speed. Why not also talk about the ZOL fair usage policy that will result in your speed being throttled to as low as 0kbps at times once you reach 5GB on an unlimitted connection. Haaa personally i blv the unlimited package shud be going for $89 bcoz sumtymz it feels like these isp’s are punishing us for wanting to use their network or more precise for wanting anything. Its a ploy on poor peoples pockets…. Most internet cafes in Harare are now on ADS; telco, yoafrica, ecoweb/zol, valley equipment is now gathering dust, that is reduntant masts, vsat equipmnt, wimax equipmnt etc. Also check with most schools country wide who were on liquid/zol vsat, they are now on telone KaBand. My problems with Zol is advertising and enticing people with “UNLIMITED” which they throttle through their bandwidth mngmnt software. zol is doing a good thing though, good things take time, the cost of data will eventually go down and it with it the consumer price too, then we will be complaining about something else…. Download as much as you want at 0kbps. I am sure you don’t even subscribe to a single ZOL package. NOT AVAILABLE IN BULAWAYO – CHECKED TODAY. i must say ZOL is very sneeky in their business. after paying $49 i was told i stil have to pay $39 for activation despite the fact that they are toting a promo of a month free.